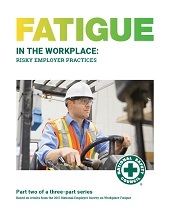 Fatigue in the Workplace: Risky Employer Practices is the second in a three-part series of reports produced by the National Safety Council on the prevalence of fatigue in the American workforce. This report releases new data from the Employer Survey on Workplace Fatigue conducted in June 2017 with 504 human resources decision makers who are responsible for health, safety and/or shift scheduling. After sign-up, you will receive an email from Emily.whitcomb@nsc.org with a link to view and download the report. If you do not receive the email within a few minutes, first check your junk mail folder or email us at Emily.whitcomb@nsc.org.